So this year for my nephew Owen's third birthday he decided he wanted a party based on his favorite book right now which is Dragons Love Tacos by Adam Rubin. This is a super cute book about dragons that love tacos, so if you want to lure dragons to your party better serve tacos, but better watch out for that spicy salsa. I decided to use the cover art dragon for the cake but made him green instead of red because that is Owen's favorite color. 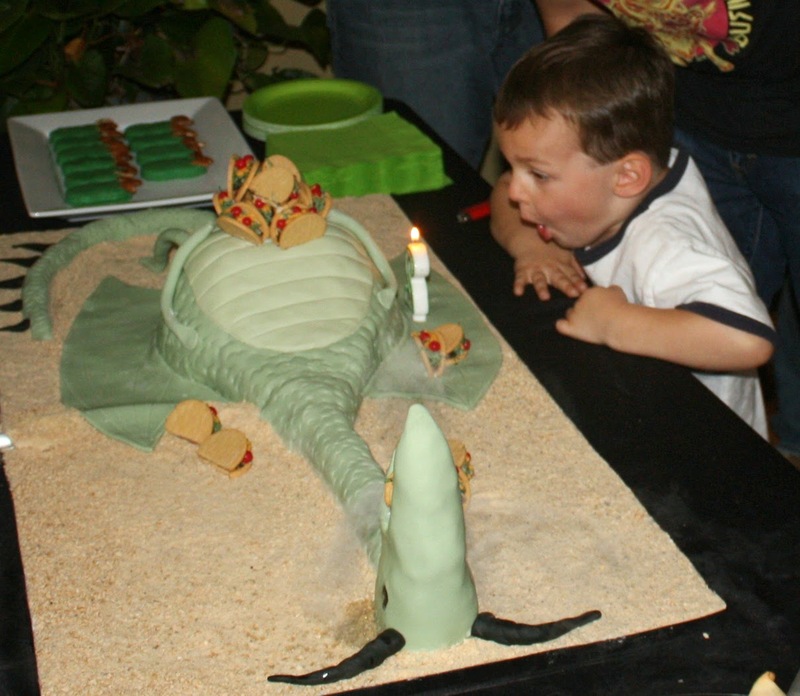 Of course as with every cake we make for Owen it has to be special so we decided to make this dragon smoke because he had to much spicy salsa at this party. 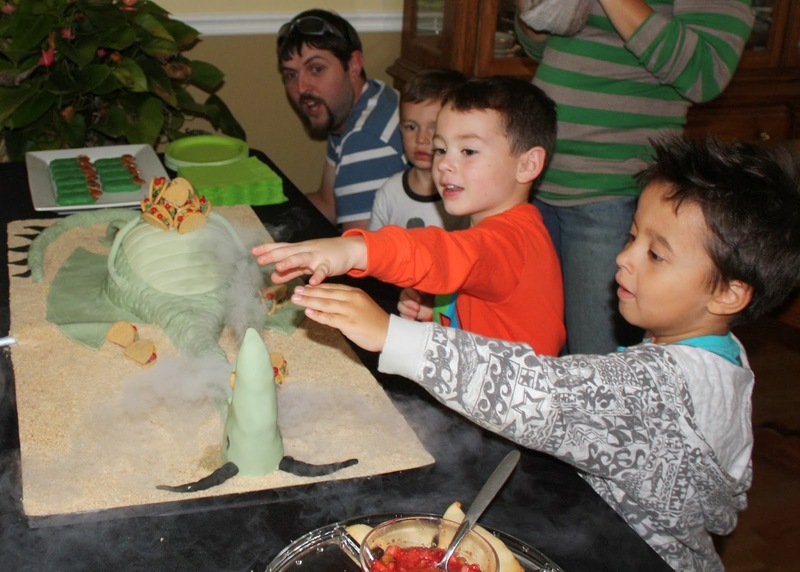 The smoking dragon was a big hit with all the kids. I also included sugar cookie "chips" with fruit "salsa" and dragon feet cookies. Hope you enjoy the party this year. If you missed last years party be sure to check it out here. 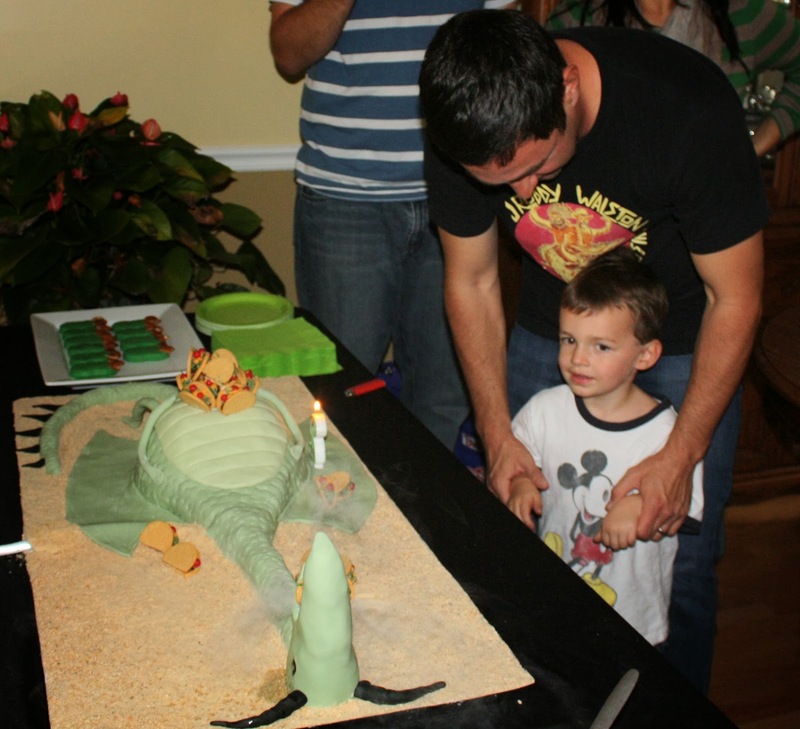 We decided on less desserts this year and focused more on the dragon cake. I think it turned out really well and Owen loved it! The tacos are made from Oreo cookies. I will be sharing a tutorial on how to make them in the near future. Of course if we wanted to lure dragons to the party we had to have a taco bar! Time to break open the dragon pinata! This was a favorite activity! Too much spicy salsa for this dragon! Making the dragon smoke was a little tricky to figure out but we managed to pull it off and have more knowledge moving forward for our next smoking cake! Happy Birthday Owen! I hope you loved your cake and had a blast at your party! You are turning out to be one awesome little dude and I love being here to see you grow up! Here is a short video of the cake in action!